2015 greeted gamers with a lot of great games to pick and choose from. In the mainstream franchises, we had the overwhelmingly huge environments and addictive gameplay of The Witcher III: Wild Hunt, Metal Gear Solid V: The Phantom Pain, Bloodborne, and Fallout 4. Meanwhile, on the indie side of things, we had spotlight stealers in the names of Undertale and Rocket League. And if those weren’t enough to keep us satisfied for a year (because we gamers are a greedy bunch), we even had the classic Mega Man games make yet another comeback on modern consoles. It was a great year for games overall—but through all of the mindless fun that those games bring to the table, one game of 2015 piqued our interest by daring to be a bit more poignant than the majority. 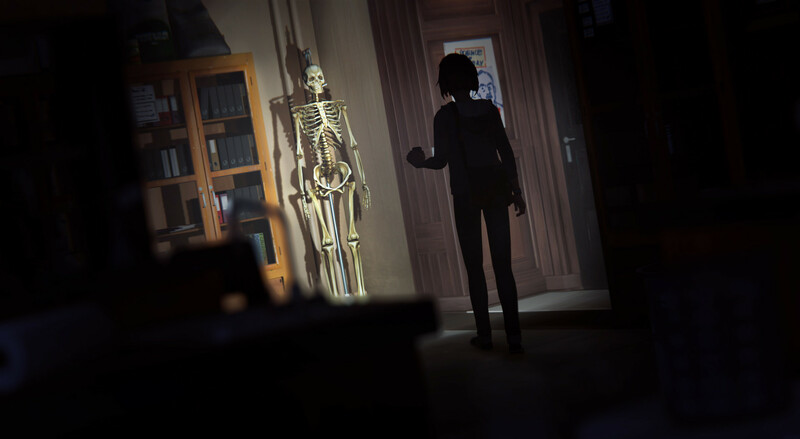 Life is Strange is a downloadable episodic graphic adventure/mystery game in the same vein as Telltale’s The Walking Dead. You take control of photography student Maxine Caulfield, who has visions of her town being destroyed by a tornado and discovers that she can rewind time. All the while she tries to uncover a missing person case that takes her into the depths of high school drama. The game leads you along a linear plotline that has you make specific choices throughout each of the game’s five episodes to determine the overall ending. The choices range from small and insignificant to major, drastic changes to your gaming and story experience. And thanks to Max’s special ability, you can rewind time at any moment and create a seemingly infinite number of possibilities for how to execute your choices. In between plotlines and events, you can roam free around your environment and explore, talk to bystanders, perform fetch quests, and solve environmental puzzles to advance to the next area and/or save yourself. Despite its sub-par lip-syncing and graphics, as well as some very strange and out-of-place dialogue choices, there’s a lot to love about Life is Strange. The mature take on the high school environment allows this game to explore many heavy subjects and issues that make the world feel alive and real. Everywhere you go, there’s some form of tonal and thematic polish that adds to the high school setting, and you get more and more engrossed in this world every time you discover something new. The time travel mechanic is also implemented extraordinarily well. You can literally time travel anytime you want whether you’d like to undo an action, get more time solving a puzzle, have a conversation with someone go differently so you can get on their good side, talk to a different person entirely, or change a drastic decision just to see how it plays out. In the first episode, there’s a great section where you’re walking around the school courtyard and you can literally talk to everybody and have a different conversation with each one based on the information you learn about them from your previous conversation. Sections like this give a great sense of power and freedom to the player that adds to their curiosity about how this world works and what makes these characters tick. 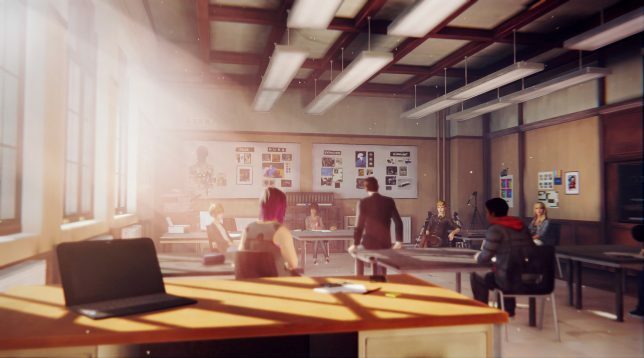 This is where Life is Strange really shines. It oozes with character. Whoever wrote these characters should write a screenplay, because the development and how these characters interact with you is incredibly well done. The game doesn’t stop everything and tell you all you need to know about one character. You gradually learn about them through their actions, reactions, and other subtle character motifs that tell you a lot through visual means. Every character acts how a real person would act in their specific situation. Max doesn’t abuse her power; she’s afraid of it. Because, let’s be honest—as much as we’d like to think we would use that time travel power to mess with people, we would be scared to death of it. How these characters behave is the key to keeping the player invested in a story worthy of a philosophical and thematic analysis; one that more than lives up to the game’s quizzical title. Had as much care not been given in the writing, no player would want to see this mystery until the very end—let alone want to replay it with different choices to see how it turns out. If I know anything about the GameCola staff and my fellow readers, I know that we all love games with character. Games that feel alive at every turn; games that keep you invested every step of the way; games that look like a group of people put their hearts and souls into making something the best they could. Life is Strange demonstrates that with flying colors. And that’s why it deserved GameCola’s 2015 Readers’ Choice Award. Chapter one: Already traumatizing, will not be buying this one!